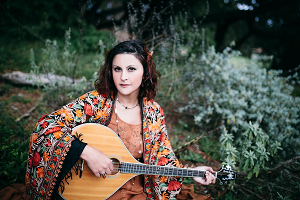 Northern California based folk singer-songwriter Liz Ryder is a British native whose style comes from many places between the Long Mynd and the golden hills of California. Rooted in traditional English folk, she has a passion for rendering the old with a mind for the new. Accompanying herself with fingerstyle guitar, Celtic bouzouki, banjo, and sometimes folk harp, she plays both traditional and self-penned music that is of a dynamic and honest nature. She made her first folk album at age 18, and shortly after was given notoriety at festivals and on radio in the UK. Froots Magazine dubbed her, “The next in the Kate Rusby/Bill Jones Continuum”, and Cambria Arts Wales said, “Liz Ryder deserves a prominent place in the new wave of British folk performers.” Since then, she has released three more albums, three EPs, and has toured extensively in the UK and California. She will release her 4th studio album, Butterflies and Thieves, in Summer 2019. Liz is a seasoned folk singer and musician. In recent years she has proven herself to be a serious and vibrant presence on the folk scene. She has performed at the Sacramento World Music and Dance Festival, the San Francisco Folk Festival, and on other main festival stages such as Sidmouth, Broadstairs, Towersey, Warwick, and many more in the UK. She has opened for Richard Thompson, Jez Lowe, and Eric Taylor, and has performed at notable venues and folk clubs like the 24th St Theater Sacramento, Bazaar Cafe and Red Devil in SF, the Bedford Globe in London, and the Red Lion Folk Club in Birmingham, UK, to name a few.